Dell has recently presented a video of their new Windows tablet called the Dell Latitude ST in its Malaysian website. Although it was already rumored this summer about this windows tablet but now it seems clear that the company is targeting enterprise customers. 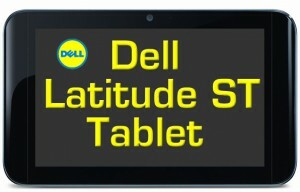 The promotional video shows that this tablet features an Intel Atom processor and will be powered by Windows 7 operating system. It is provided with a multitouch display which supports a stylus. Other specifications include USB, SD card and HDMI ports. Two cameras are also included one at the front and another at the rear. A docking station also lets the tablet set up as the monitor of a desktop PC, which is optional though. Most important part of this tablet is that it is powered by Windows 7 platform which will allow it to easily get into any existing network and it will be easy to for the IT professionals to incorporate. According to earlier rumors Latitude ST is equipped with a 1.5 GHz Intel Atom Z670 processor and has a 1366 x 768 pixels display, although these details have not been confirmed yet. The price of the model as well as the release date is yet to be provided.